Come for a drink. Stay for the view. Stirr, opened in October, is a Deep Ellum restaurant-bar that offers refined dining options, crafty cocktails, awesome patio views of the city skyline, and plenty of space to party. Atmosphere: The large downstairs dining area is filled with high tables, communal tables, banquette spots, and two-seaters—a surprising number of which, on a random weeknight, were occupied. The black-and-white tiled bar forms the centerpiece of the restaurant, and near the back, a big wooden wine rack covers an entire wall. Stirr’s big windows, geometric sun-shaped light fixture, and polished touches give the place a futuristic feel; the brick walls and wooden tables keep it grounded. You’ll find quotes peppered throughout the bar on stairs and walls. 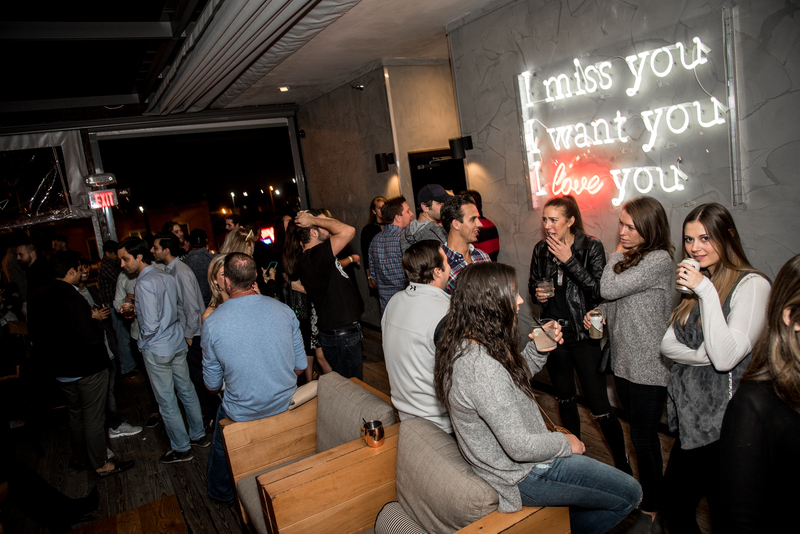 By the front entrance, you’ll find a flight of stairs (which are stenciled with quotes like “In the end we only regret the chances we didn’t take”) leading to an upstairs rooftop party patio— a 3,000-square-foot space complete with a standalone bar, electronic photo booth, and great view of the city. Flat screens flash over the bar, vaguely recognizable pop-punk music plays overhead, and people take turns snapping selfies with the skyline in the background. What to Order: Stirr serves brunch options (including a $13 giant cinnamon roll), lunch, and dinner. Theirs is a meat-heavy menu, featuring venison, quail, prawns, and other hapless creatures (though to be fair, Stirr also offers a delicious-looking tofu tikka masala), as well as salads and fancy-sounding appetizers (like tempura-fried cactus). Plenty of people come for a meal, but the drink menu is not to be overlooked. The restaurant-bar offers crafted cocktails with names such as Girl From Dallas and Beet It Nerd. The Beet It Nerd cocktail features rum, brown sugar syrup, lime juice, and beet juice; Babe’s Old Fashioned includes bacon fat-infused Rittenhouse rye and chocolate liqueur. Looking for something sweet and refreshing? Try the Girl From Dallas (Lillet Blanc, strawberry puree, ice cubes). Stirr also serves “after dinner” cocktails (Irish coffee and the creamy Bourbon Lift) as well as “large format” drinks (refreshing sharing-sized concoctions served out on the rooftop patio). 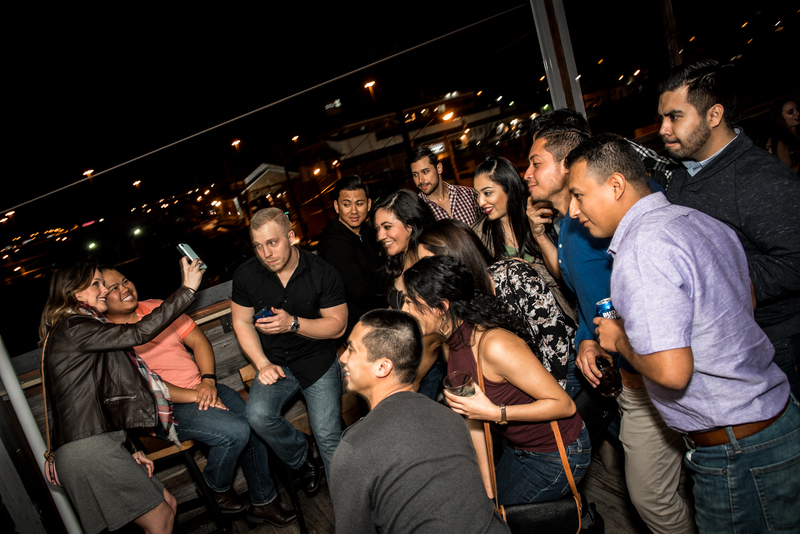 The skyline, visible from the 3,000-square-foot patio, is the ideal backdrop for selfies. Who’s There: In the dining area, you’ll find a diverse collection of patrons: couples, groups, and parents with young kids. The downstairs vibe is low-key and chill; families dined and several single men watched TV and sipped drinks. Upstairs has a bit of a party feel: Women on a ladies’ night out chatted at the bar; a couple sitting side-by-side clinked their cocktail glasses; and, amid confetti-strewn tables and balloons, at least one birthday party ensued. Stirr is not pretentious—their costumers sport T-shirts as well as cocktail dresses—and it’s an easy place to blend into the crowd and relax. 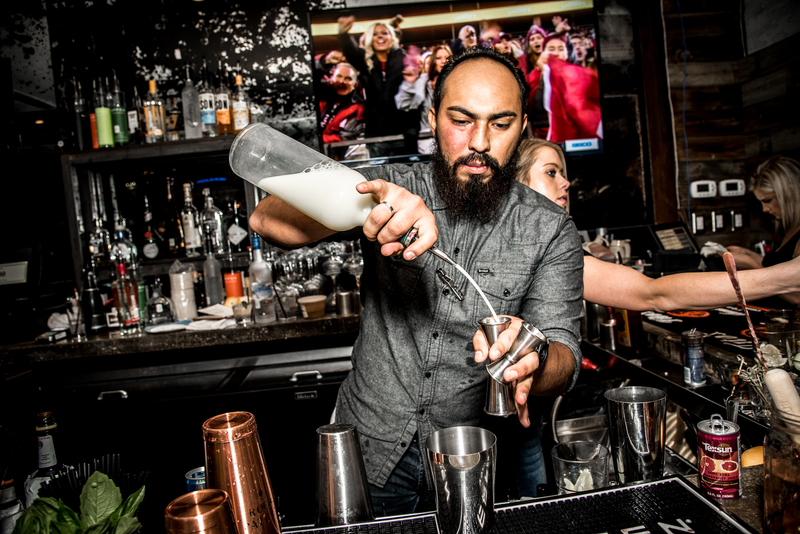 What I Didn’t Like: It didn’t exactly feel like a typical Deep Ellum bar. I’m not sure if that’s good or bad, but the place felt to me as though it belonged in Uptown. What I Did Like: The rooftop patio and bar is wonderful. Offering a $36 large-sized Sangia drink is a nice move, too.